Early to late summer. Long blooming. Zone 3. Very hardy and long lived. About as easy as it gets. Plants can be divided as a means of increase. Daylilies are extremely easy, long lived perennials. They multiply readily but are not invasive and grow well on slopes, in competition with roots from trees or bushes, under roof drip lines, and other tough places where many other plants will not survive. The foliage is attractive even when the plants are not in bloom. 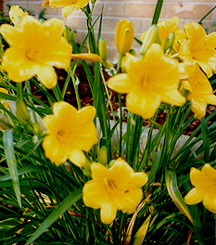 Daylilies come in many colors and range in height from 18 inches to 4 feet. The bloom season also varies depending on the variety but is generally about a month long. Each bloom lasts only a single day but, in the peak of flowering, masses of new blooms will appear each day. Daylilies will flower most profusely in full sun but will also take a fair amount of shade. They are extremely adaptable to just about any soil type but perform best in well-drained soil high in organic matter and of only average fertility. Too rich a soil will result in lush foliage but fewer flowers. There are literally thousands of varieties of daylilies. Some of the more exotic cultivars command prices near $30 or more for a single fan. The red and peach colored forms, originally from my mother's gardens, are of unknown parentage. I suspect they do not rank with the exotics but they are tough, dependable, quick spreaders and are more prolific and attractive than the wild roadside forms. Each is about 30" tall and flowers in midsummer. Stella d'Oro is shorter at 18 inches. It is often referred to as an "ever blooming" daylily. It provides deep yellow to gold flowers from June into the fall. Its neat habit makes it an excellent low border plant.